The Crystal Dragon has been shattered into pieces and scattered around the world. You play as a brave warrior who sets out to reassemble the Crystal Dragon in order to save the world. When you defeat an enemy, it follows behind, becoming part of your "line". Switch between the characters you have recruited to use their unique abilities, such as spears and grappling hooks. You can also use the line itself to attack, whipping it around to defeat more enemies. 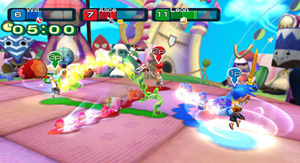 The game comes with a multiplayer scenario mode and several battle modes, including Battle Royale, Flag Battle and Tag Match.